Wind for Schools worked with several teachers who expressed interest in using bicycle generators to teach their students some fundamental concepts of energy and basic mechanical, engineering, and electrical principles. With this project we worked with K-12 and college students to organize hands-on design and construction of bike generators. We then used the bike generators in the classroom for fun demonstrations which increased students’ understanding and awareness of energy topics. In 2010, Jeff Hines, a local Flagstaff teacher who also served as the first WindSenator in Arizona, inspired us to pursue bicycle generators for use in K-12 classrooms. Shortly after, we learned of an NAU student, Matthew Petney, who had built a double-bike generator, which included a battery for energy storage and an inverter and outlet so normal 120-volt devices could be plugged into it. We purchased the system from Matt and shared it with several interested teachers and classes as an educational tool. Matt joined our team in fall 2011 to provide more technical guidance to our staff and our teacher partners in building bike generators, bike blenders, and more. In fall 2011 and spring 2012, Marilla Lamb and Matthew Petney visited two of our partner schools (Flagstaff Junior Academy and Orme School) to build bike blenders and a bike generator with middle and high school students. The students were presented with the design challenge, as well as tools and materials, and worked with our staff to design and build the bikes. These bikes were used at several school events, and in the classroom the following year as a teaching tool. In 2011, Marilla Lamb wrote a grant to NAU’s Green Fund to fund a bicycle-powered charging station (The Eco-Pedaler), complete with energy meters so students can see the energy they produce and the energy they use, and with transparent coverings so all components are visible. The project was funded and a team of students designed and built the bike during 2012. The completed charging station can be seen in NAU’s engineering building. Now, a team of senior electrical and mechanical engineering students are working on the second iteration of the charging station, which is also funded by NAU’s Green Fund to improve its usability and versatility. Wind for Schools was awarded funding from the APS Leadership Grant program in 2012, and obtained nearly $5,000 to work with several teachers in Arizona at some of our partner schools to build bicycle generators either in their science classes or with their science clubs. Our team built these bike generators with students at Mount Elden Middle School, Coconino High School, STAR School, Williams High School, and Northland Preparatory Academy in Spring 2013. Several energy lessons accompany the bicycle generators that we built and worked with in K-12 classrooms. The bike generator is a great tool for explaining difficult concepts like energy, power, electricity, and energy conversions. When students use the bike generator, they get a physical, hands-on understanding of these concepts. It’s also a fun activity as students try to keep a ball in the air with a leaf blower, heat a hair dryer, or light a bulb. Explore the links below for curriculum resources and to learn how to build a bike generator. 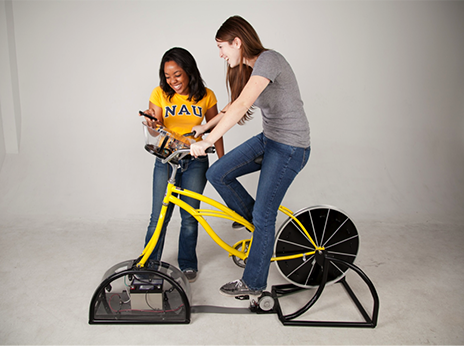 In spring 2012, students working with Wind for Schools received money from NAU’s Green Fund to design and build a bicycle-powered charging station. The Eco-Pedaler is used by students and faculty as an alternative source of power for charging their electronic devices such as iPods and cell phones. The system generates electricity when someone pedals the bicycle, which allows them to charge their electronic device with the appropriate charger provided at the station. Accompanying the system is educational information discussing the implications of traditional energy sources and stressing the importance of new, renewable energy technologies. In addition, users can see the amount of power they are producing and compare it with the amount they are using. This provides students with a way to understand and compare the amount of energy required to power an electronic device like a cell phone with the amount of energy they are able to produce pedaling a bicycle. The Eco-Pedaler is installed on the second floor of the Engineering Building on the NAU campus. View documents and resources for building a bicycle powered charging station. Two teams of senior mechanical and electrical engineering students at NAU are currently working on designing a second iteration of the charging station to improve its usability and versatility. This charging station will be mobile, will have a more interactive display with additional information, and will provide AC power so many more appliances can be powered with it.